As part of Grab’s Better 365 initiatives, they have announced improvements in the Grab’s driver partner app that will help improve the driving experience. Starting May 2018, Grab will officially launch the Passenger No-Show Cancellation Feature. 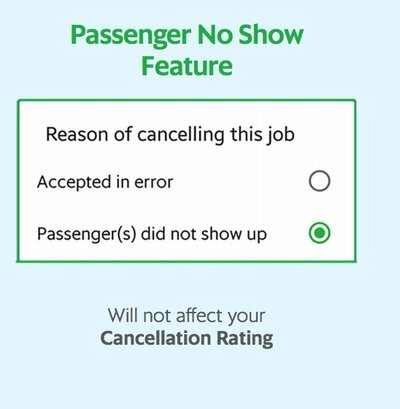 The new Passenger No-Show feature allows the driver to cancel the trip in the event that the Passenger does not show up without affecting the driver’s Cancellation Rating. Grab drivers will no longer be penalized when it is the rider’s fault for a no-show. Drivers MUST fulfil 3 conditions to use the feature without affecting their cancellation rate. All conditions must be fulfiled in order not to affect driver cancellation ratings. Driver Partners are only allowed to use the Passenger No-Show feature that will not affect their Cancellation Rating up to 3 times a week. The trip count will be between Monday to Sunday and quota resets Sunday 2359hours. Drivers who use the option more than 3 times in a week will see their cancellation ratings increased even though all conditions are met. Grab drivers are reminded to update their Driver app to the latest versions. 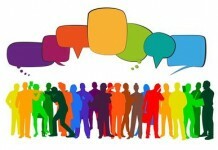 5.34.0 for Android and 1.21.0 for Apple iOS and above. For the longest time, Grab drivers were left frustrated when the rider does not show up. They wasted time, petrol and effort to get to the rider’s pick-up point only to experience “Kena fly aeroplane” by the rider. Worse still, the rider does not respond to text, calls and refuse to cancel the trip as they do not want to incur a fee under Grab cancellation penalty. At this point, drivers will either sacrifice their Cancellation Rating by cancelling the trip on their side or engage in a tedious conversation with Grab customer service hotline to get them to cancel it for them. There will also be an Auto Accept Feature incorporated into the driver app. All incoming trips will be automatically accepted for the driver, similar to what Uber is doing for all UberPool trips. 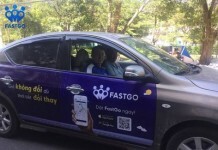 The new feature will be a relief for many drivers who have problem toggling between the driver app and the GPS while keeping their eyes on the road. The feature is likely to address a longstanding issue that many Grab riders complained about. Riders often complain that it takes a long time to get a Grab Driver to accept their trip request and sometimes they have to request more than once to get a driver. 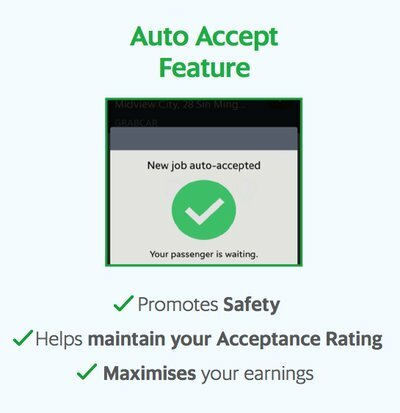 With the Auto-Accept Feature, the trip request is immediately assigned to the nearest available driver and in turn, riders can get a confirmed trip instantly.